Sign Up To Stay Informed ! Flies and bugs are soon to be buzzing around your barn and horses once the temperature begins to rise. Spring is right around the corner and summer is on its heels, the perfect time for bugs to breed and inundates your property. The good news is that there are some things you can do to help reduce the number of bugs in your barn. Bugs and flies are the never stopping enemy of any barn owner. They thrive in the barn environment, but there are ways to discourage them. Reduce Moisture – Many insects breed in water or moist areas, and they require water for drinking. Standing water is a luxury hotel to a mamma and papa mosquito. Eliminating low-pasture areas where standing water collects, keeping stalls dry, repairing hose leaks, covering ran barrels and replacing water in troughs daily can help immensely. Survey your land for items that collect rainwater and turn them over or remove them. Taking away bugs breeding grounds can significantly reduce the number of bugs on your property. Manage Manure – Flies may be the most annoying bug in a horse’s life, and they dine on horse manure. Daily cleaning of stalls, pens and any other confined areas is ideal. Removal of all manure off property weekly helps too. If removal isn’t possible as often, be sure to cover it with a tarp, so dinner isn’t readily available to hungry flies. Break out the Fans – Blowing air seems to annoy flies. Placing fans in your barn to help keep them at bay is helpful and may even be soothing to your horses, especially in the heat of summer. Garbage & Food Covered – Disposing of garbage promptly and keeping lids on trashcans can deter bugs and flies from feasting. In addition, keep lids on grains and other animal feed at all times to avoid infestation. Bugs and flies in the barn are not only annoying, but they can spread disease and harm your animals. Diseases such as salmonella, influenza, equine infectious anemia and so much more can be spread by bugs. 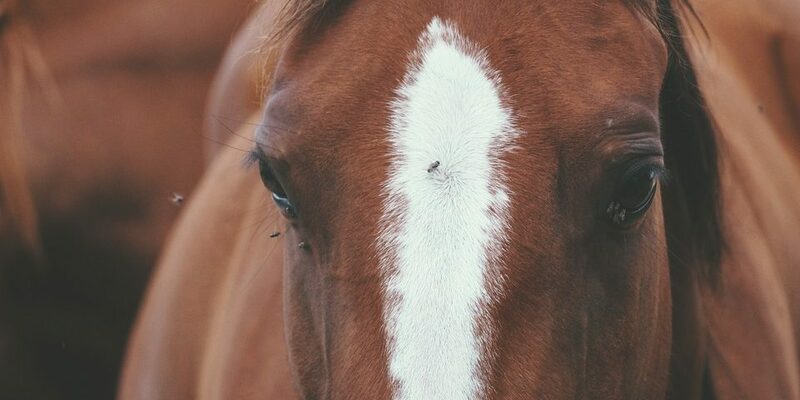 Horses and barn animals can have allergic reactions to bites and stings such as dermatitis and conjunctivitis. Dealing with bugs can interrupt animals feed and rest times, causing them undue stress. 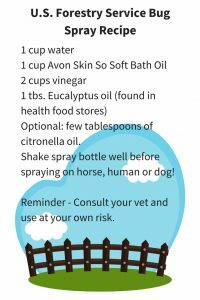 The US Forest Service has a recipe for a DIY bug spray you can mix in your kitchen and keep on hand in the barn to help alleviate the discomfort of bugs. Be prepared this spring and summer with a little maintenance around the barn and your animals are sure to appreciate it. © 2019 Horse Property. All Rights Reserved. Sitemap.